Bladder cancer is a common urologic cancer that has the highest recurrence rate of any malignancy. In North America, South America, Europe, and Asia, the most common type is transitional cell carcinoma. Other types include squamous cell carcinoma (see the image below) and adenocarcinomas. Alternatively, a bladder-sparing approach of TURBT followed by concurrent radiation therapy and systemic chemotherapy (trimodality therapy) may be used. Erdafitinib, a fibroblast growth factor receptor inhibitor, is approved for locally advanced or metastatic urothelial carcinoma that has FGFR2 or FGFR3 genetic alterations and has progressed during or following at least 1 line of prior platinum-containing chemotherapy. Bladder cancer is a common urologic cancer. Almost all bladder cancers originate in the urothelium, which is a 3- to 7-cell mucosal layer within the muscular bladder. Squamous cell carcinoma (SCC) is the second most common cell type associated with bladder cancer in industrialized countries. In the United States, around 5% of bladder cancers are SCCs. Worldwide, however, SCC is the most common form of bladder cancer, accounting for 75% of cases in developing nations (see Epidemiology). In the United States, the development of SCC is associated with persistent inflammation from long-term indwelling Foley catheters and bladder stones, as well as, possibly, infections. 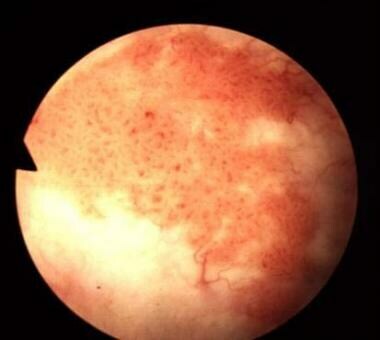 In developing nations, SCC is often associated with bladder infection by Schistosoma haematobium (see Etiology). Approximately 2% of bladder cancers are adenocarcinomas. Nonurothelial primary bladder tumors are extremely rare and may include small cell carcinoma, carcinosarcoma, primary lymphoma, and sarcoma (see Pathophysiology). Small cell carcinoma of the urinary bladder accounts for only 0.3-0.7% of all bladder tumors. High-grade urothelial carcinomas can also show divergent histologic differentiation, such as squamous, glandular, neuroendocrine, and sarcomatous features. The clinical course of bladder cancer is marked by a broad spectrum of aggressiveness and risk. Low-grade, superficial bladder cancers have minimal risk of progression to death; however, high-grade non–muscle-invasive cancers frequently progress and muscle-invasive cancers are often lethal (see Prognosis). The classic presentation of bladder cancer is painless gross hematuria, which is seen in approximately 80-90% of patients. Physical examination results are often unremarkable (see Presentation). Cystoscopy, cytology, and biopsy when necessary are the principal diagnostic tests (see Workup). 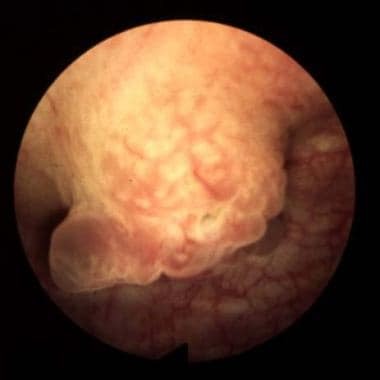 Upon presentation, 55-60% of patients have low-grade, noninvasive disease, which is usually treated conservatively with transurethral resection of bladder tumor (TURBT) and periodic cystoscopy. Intravesical agents may also be given selectively to decrease the frequency of recurrences. The remaining patients have high-grade disease, of which 50% is muscle invasive and is typically treated with radical cystectomy or with trimodality therapy (ie, TURBT followed by concurrent radiation therapy and systemic chemotherapy; see Treatment). Carcinoma in situ (CIS) is managed by TURBT and instillation of chemotherapeutic or immunotherapeutic agents—most commonly, immunotherapy with bacillus Calmette-Guérin (BCG) vaccine—into the bladder via catheter. These intravesical treatments are not effective in the 20% of patients in whom cancer has invaded the bladder wall muscle; those cases require cystectomy or a combination of radiation therapy and chemotherapy (see Treatment). Bladder cancer has the highest recurrence rate of any malignancy. Although most patients with bladder cancer can be treated with organ-sparing therapy, most experience either recurrence or progression, creating a great need for accurate and diligent surveillance (see Treatment). The bladder is an extraperitoneal muscular urine reservoir that lies behind the pubis symphysis in the pelvis. At the dome of the bladder lies the median umbilical ligament, a fibrous cord that is anchored to the umbilicus and that represents the obliterated urachus (allantois). The ureters, which transport urine from kidney to bladder, approach the bladder obliquely and posterosuperiorly, entering at the trigone (the area between the interureteric ridge and the bladder neck). The intravesical ureteral orifices are roughly 2-3 cm apart and form the superolateral borders of the trigone. The bladder neck serves as an internal sphincter, which is sacrificed during a radical cystectomy. Initial lymphatic drainage from the bladder is primarily into the external iliac, obturator, internal iliac (hypogastric), and common iliac nodes. Following the drainage to these sentinel pelvic regions, spread may continue to the presacral, paracaval, interaortocaval, and para-aortic lymph node chains. Bladder cancer is often described as a polyclonal field change defect with frequent recurrences due to a heightened potential for malignant transformation. However, bladder cancer has also been described as resulting from implantation of malignant cells that have migrated from a previously affected site. The latter occurs less often and may account for only a small percentage of cases. Use of the common term superficial bladder cancer should be discouraged. The term implies a harmless nature, which is misleading in many instances. 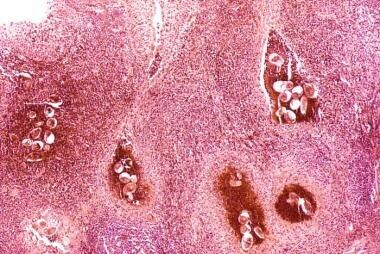 Because it was used to describe the disparate disorders of low-grade papillary bladder cancer and the markedly more aggressive form, carcinoma in situ (CIS), the World Health Organization (WHO) has recommended it be abandoned. In its place, the term non–muscle-invasive bladder cancer should be used and qualified with the appropriate American Joint Committee on Cancer stage (ie, Ta, T1, Tis). Stage T1 cancer invades lamina propria but not the muscle of the bladder. High-grade T1 tumor associated with CIS carries a relatively high risk for disease recurrence and progression (approximately 60%). Transitional cell carcinoma (TCC) arises from stem cells that are adjacent to the basement membrane of the epithelial surface. Depending on the genetic alterations that occur, these cells may follow different pathways in the expression of their phenotype. The most common molecular biologic pathway for TCCs involves the development of a papillary tumor that projects into the bladder lumen and, if untreated, eventually penetrates the basement membrane, invades the lamina propria, and then continues into the bladder muscle, where it can metastasize. Nearly 90% of transitional cell bladder tumors exhibit this type of behavior. This progression occurs with high-grade cancers only. Low-grade cancers rarely, if ever, progress and are thought to have a distinct molecular pathway, different from the high-grade cancers and CIS. The remaining 10% of TCCs follow a different molecular pathway and are called CIS. This is a flat, noninvasive, high-grade urothelial carcinoma tumor that spreads along the surface of the bladder and, over time, may progress to an invasive form of cancer that behaves the same as invasive TCC. Many urothelial tumors are primarily composed of TCC but contain small areas of squamous differentiation, squamous cell carcinoma (SCC), or adenocarcinoma. SCC of the urinary bladder is a malignant neoplasm that is derived from bladder urothelium and has a pure squamous phenotype. [4, 5, 6] SCC of the bladder is essentially similar to squamous cell tumors arising in other organs. Because many urothelial carcinomas contain a minor squamous cell component, a diagnosis of SCC of the bladder should be rendered only when the tumor is solely composed of squamous cell components, with no conventional urothelial carcinoma component. Adenocarcinomas account for less than 2% of primary bladder tumors. These lesions are observed most commonly in exstrophic bladders and are often associated with malignant degeneration of a persistent urachal remnant. Other rare forms of bladder cancer include leiomyosarcoma, rhabdosarcoma, carcinosarcoma, lymphoma, and small cell carcinoma. Leiomyosarcoma is the most common sarcoma of the bladder. Rhabdomyosarcomas most commonly occur in children. Carcinosarcomas are highly malignant tumors that contain a combination of mesenchymal and epithelial elements. Primary bladder lymphomas arise in the submucosa of the bladder. Except for lymphomas, all these rare bladder cancers carry a poor prognosis. Small cell carcinoma of the urinary bladder is a poorly differentiated, malignant neoplasm that originates from urothelial stem cells and has variable expression of neuroendocrine markers. Morphologically, it shares features of small cell carcinoma of other organs, including the lung. Divergent, yet interconnected and overlapping, molecular pathways are likely responsible for the development of noninvasive and invasive bladder tumors. Somatic mutations in fibroblast growth receptor3 (FGFR-3) and tumor protein p53 (TP53) in tumor cells appear to be important early molecular events in the noninvasive and invasive pathways, respectively. In advanced disease, multiple mechanisms may lead to tumor progression. These include those that promote proliferation, survival, invasion, and metastasis, as well as those that involve deficiencies in DNA damage repair and the finding of stemlike cells. The risk of developing bladder carcinoma is 2-6 times greater in smokers than in nonsmokers. This risk appears to be similar between men and women. Nitrosamine, 2-naphthylamine, and 4-aminobiphenyl are possible carcinogenic agents found in cigarette smoke. People living in urban areas are also more likely to develop bladder cancer. The etiology in these cases is thought to be multifactorial, potentially involving exposure to numerous carcinogens. Although certain common genetic polymorphisms appear to increase susceptibility in persons with occupational exposure associated with increased bladder cancer risk,  no convincing evidence exists for a hereditary factor in the development of bladder cancer. Nevertheless, familial clusters of bladder cancer have been reported. Histopathology of bladder shows eggs of Schistosoma haematobium surrounded by intense infiltrates of eosinophils and other inflammatory cells. 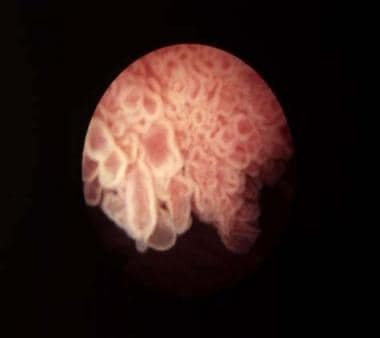 The eggs are found embedded in the lamina propria and muscularis propria of the bladder wall. Many of the eggs are destroyed by host reaction and become calcified, resulting in a lesion commonly known as a sandy patch, which appears as a granular, yellow-tan surface lesion. Coffee consumption does not increase the risk of developing bladder cancer. Early studies of rodents and a minority of human studies suggested a weak connection between artificial sweeteners (eg, saccharin, cyclamate) and bladder cancer; however, most recent studies show no significant correlation. Bladder cancer is about 3 times more common in men than in women. Over the past 2 decades, however, the rate of bladder cancer has been stable in men but has increased in women by 0.2% annually. The male predominance in bladder cancer in the United States reflects the prevalence of transitional cell carcinoma (TCC). With small cell carcinoma (SCC)—in contrast to TCC—the male-to-female incidence ratio is 1:2. Bladder cancer is the fourth most common cancer in men in the United States, after prostate, lung, and colorectal cancer, but it is not among the top 10 cancers in women. Accordingly, more men than women are expected to die of bladder cancer in 2016, with 11,820 deaths in men versus 4570 in women. Nevertheless, women generally have a worse prognosis than men. Worldwide, bladder cancer is diagnosed in approximately 275,000 people each year, and about 108,000 die of this disease. In industrialized countries, 90% of bladder cancers are TCC. In developing countries—particularly in the Middle East and Africa—the majority of bladder cancers are SCCs, and most of these cancers are secondary to Schistosoma haematobium infection. Urothelial carcinoma is reported to be the most common urologic cancer in China. In Africa, the highest incidence of SCC has been seen in schistosomal-endemic areas, notably Sudan and Egypt, where SCC ranges from two thirds to three quarters of all malignant tumors of the bladder. In recent years, a few studies from Egypt have shown a reversal of this trend due to the better control of schistosomiasis in the region, whereas in other parts of Africa the association is unchanged. [8, 49, 50] Increased smoking incidence is believed to have contributed to the shift in Egypt toward TCC, which has a stronger smoking association. The recurrence rate for superficial TCC of the bladder is high. As many as 80% of patients have at least one recurrence. Prognosis for patients with metastatic urothelial cancer is poor, with only 5-10% of patients living 2 years after diagnosis. Several studies have demonstrated grading to be a significant morphologic parameter in SCC. In one series, 5-year survival rates for grade 1, 2, and 3 squamous cell carcinoma was 62%, 52%, and 35%, respectively. In the same study of patients undergoing cystectomy, the investigators suggested that a higher number of newly formed blood vessels predicts unfavorable disease outcome. Bladder cancer has the highest recurrence rate of any malignancy (ie, 70% within 5 y). Although most patients with bladder cancer can be treated initially with organ-sparing therapy, most experience either recurrence or progression. The underlying genetic changes that result in a bladder tumor occur in the entire urothelium, making the whole lining of the urinary system susceptible to tumor recurrence. The time interval to recurrence is also significant. Patients with tumor recurrences within 2 years, and especially with recurrences within 3-6 months, have an aggressive tumor and an increased risk of disease progression. Escudero DO, Shirodkar SP, Lokeshwar VB. Bladder Carcinogenesis and Molecular Pathways. Lokeshwar VB. Bladder Tumors: Molecular Aspects and Clinical Management. New York: Springer Science; 2010. 23-41. Spruck CH 3rd, Ohneseit PF, Gonzalez-Zulueta M, Esrig D, Miyao N, Tsai YC, et al. Two molecular pathways to transitional cell carcinoma of the bladder. Cancer Res. 1994 Feb 1. 54(3):784-8. [Medline]. Tomlinson DC, Baldo O, Harnden P, Knowles MA. FGFR3 protein expression and its relationship to mutation status and prognostic variables in bladder cancer. J Pathol. 2007 Sep. 213(1):91-8. [Medline]. [Full Text]. Eswarakumar VP, Lax I, Schlessinger J. Cellular signaling by fibroblast growth factor receptors. Cytokine Growth Factor Rev. 2005 Apr. 16(2):139-49. [Medline]. Fadl-Elmula I. Chromosomal changes in uroepithelial carcinomas. Cell Chromosome. 2005 Aug 7. 4:1. [Medline]. [Full Text]. Knowles MA. Molecular subtypes of bladder cancer: Jekyll and Hyde or chalk and cheese?. Carcinogenesis. 2006 Mar. 27(3):361-73. [Medline]. Salinas-Sánchez AS, Lorenzo-Romero JG, Giménez-Bachs JM, Sánchez-Sánchez F, Donate-Moreno MJ, Rubio-Del-Campo A, et al. Implications of p53 gene mutations on patient survival in transitional cell carcinoma of the bladder: a long-term study. Urol Oncol. 2008 Nov-Dec. 26(6):620-6. [Medline]. Miyamoto H, Shuin T, Ikeda I, Hosaka M, Kubota Y. Loss of heterozygosity at the p53, RB, DCC and APC tumor suppressor gene loci in human bladder cancer. J Urol. 1996 Apr. 155(4):1444-7. [Medline]. Karam JA, Lotan Y, Karakiewicz PI, Ashfaq R, Sagalowsky AI, Roehrborn CG, et al. Use of combined apoptosis biomarkers for prediction of bladder cancer recurrence and mortality after radical cystectomy. Lancet Oncol. 2007 Feb. 8(2):128-36. [Medline]. Campbell SC, Volpert OV, Ivanovich M, Bouck NP. Molecular mediators of angiogenesis in bladder cancer. Cancer Res. 1998 Mar 15. 58(6):1298-304. [Medline]. Chan KS, Espinosa I, Chao M, Wong D, Ailles L, Diehn M, et al. Identification, molecular characterization, clinical prognosis, and therapeutic targeting of human bladder tumor-initiating cells. Proc Natl Acad Sci U S A. 2009 Aug 18. 106(33):14016-21. [Medline]. [Full Text]. Sanchez-Carbayo M, Socci ND, Lozano J, Saint F, Cordon-Cardo C. Defining molecular profiles of poor outcome in patients with invasive bladder cancer using oligonucleotide microarrays. J Clin Oncol. 2006 Feb 10. 24(5):778-89. [Medline]. Freedman ND, Silverman DT, Hollenbeck AR, Schatzkin A, Abnet CC. Association between smoking and risk of bladder cancer among men and women. JAMA. 2011 Aug 17. 306(7):737-45. [Medline]. [Full Text]. Cumberbatch MG, Cox A, Teare D, Catto JW. Contemporary Occupational Carcinogen Exposure and Bladder Cancer: A Systematic Review and Meta-analysis. JAMA Oncol. 2015 Dec. 1 (9):1282-90. [Medline]. Baris D, Waddell R, Beane Freeman LE, Schwenn M, Colt JS, et al. Elevated Bladder Cancer in Northern New England: The Role of Drinking Water and Arsenic. J Natl Cancer Inst. 2016 Sep. 108 (9):[Medline]. Nelson R. Arsenic-Contaminated Well Water Boosts Bladder Cancer Risk. Medscape Medical News. Available at http://www.medscape.com/viewarticle/862914. May 5, 2016; Accessed: May 7, 2016. Figueroa JD, Koutros S, Colt JS, Kogevinas M, Garcia-Closas M, et al. Modification of Occupational Exposures on Bladder Cancer Risk by Common Genetic Polymorphisms. J Natl Cancer Inst. 2015 Nov. 107 (11):[Medline]. Cancer Facts & Figures 2019. American Cancer Society. Available at https://www.cancer.org/content/dam/cancer-org/research/cancer-facts-and-statistics/annual-cancer-facts-and-figures/2019/cancer-facts-and-figures-2019.pdf. Accessed: January 31, 2019. Cancer Stat Facts: Bladder Cancer. National Cancer Institute. Available at https://seer.cancer.gov/statfacts/html/urinb.html. Accessed: January 31, 2019. Dawson C, Whitfield H. ABC of Urology. Urological malignancy--II: Urothelial tumours. BMJ. 1996 Apr 27. 312(7038):1090-4. [Medline]. [Full Text]. Abrahams NA, Moran C, Reyes AO, Siefker-Radtke A, Ayala AG. Small cell carcinoma of the bladder: a contemporary clinicopathological study of 51 cases. Histopathology. 2005 Jan. 46(1):57-63. [Medline]. Lohrisch C, Murray N, Pickles T, Sullivan L. Small cell carcinoma of the bladder: long term outcome with integrated chemoradiation. Cancer. 1999 Dec 1. 86(11):2346-52. [Medline]. Griffiths TR, Charlton M, Neal DE, Powell PH. Treatment of carcinoma in situ with intravesical bacillus Calmette-Guerin without maintenance. J Urol. 2002 Jun. 167(6):2408-12. [Medline]. Shahab N. Extrapulmonary small cell carcinoma of the bladder. Semin Oncol. 2007 Feb. 34(1):15-21. [Medline]. Mackey JR, Au HJ, Hugh J, Venner P. Genitourinary small cell carcinoma: determination of clinical and therapeutic factors associated with survival. J Urol. 1998 May. 159(5):1624-9. [Medline]. Choong NW, Quevedo JF, Kaur JS. 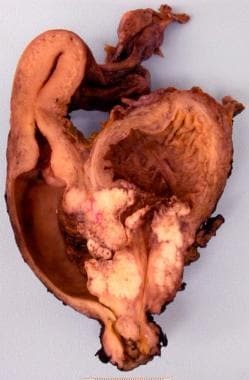 Small cell carcinoma of the urinary bladder. The Mayo Clinic experience. Cancer. 2005 Mar 15. 103(6):1172-8. [Medline]. van Rhijn BW, Burger M, Lotan Y, Solsona E, Stief CG, Sylvester RJ, et al. Recurrence and progression of disease in non-muscle-invasive bladder cancer: from epidemiology to treatment strategy. Eur Urol. 2009 Sep. 56(3):430-42. [Medline]. Fernandez-Gomez J, Solsona E, Unda M, Martinez-Piñeiro L, Gonzalez M, Hernandez R, et al. Prognostic factors in patients with non-muscle-invasive bladder cancer treated with bacillus Calmette-Guérin: multivariate analysis of data from four randomized CUETO trials. Eur Urol. 2008 May. 53(5):992-1001. [Medline]. Cha EK, Tirsar LA, Schwentner C, Christos PJ, Mian C, Hennenlotter J, et al. Immunocytology is a strong predictor of bladder cancer presence in patients with painless hematuria: a multicentre study. Eur Urol. 2012 Jan. 61(1):185-92. [Medline]. Strittmatter F, Buchner A, Karl A, Sommer ML, Straub J, Tilki D, et al. Individual learning curve reduces the clinical value of urinary cytology. Clin Genitourin Cancer. 2011 Sep. 9(1):22-6. [Medline]. Lotan Y, Roehrborn CG. Cost-effectiveness of a modified care protocol substituting bladder tumor markers for cystoscopy for the followup of patients with transitional cell carcinoma of the bladder: a decision analytical approach. J Urol. 2002 Jan. 167(1):75-9. [Medline]. Apolo AB, Vogelzang NJ, Theodorescu D. New and promising strategies in the management of bladder cancer. Am Soc Clin Oncol Educ Book. 2015. 35:105-12. [Medline]. [Full Text]. Grossfeld GD, Litwin MS, Wolf JS Jr, Hricak H, Shuler CL, Agerter DC, et al. Evaluation of asymptomatic microscopic hematuria in adults: the American Urological Association best practice policy--part II: patient evaluation, cytology, voided markers, imaging, cystoscopy, nephrology evaluation, and follow-up. Urology. 2001 Apr. 57(4):604-10. [Medline]. Murphy WM, Crabtree WN, Jukkola AF, Soloway MS. The diagnostic value of urine versus bladder washing in patients with bladder cancer. J Urol. 1981 Sep. 126(3):320-2. [Medline]. Lokeshwar VB, Soloway MS. Current bladder tumor tests: does their projected utility fulfill clinical necessity?. J Urol. 2001 Apr. 165(4):1067-77. [Medline]. Grossman HB, Soloway M, Messing E, Katz G, Stein B, Kassabian V, et al. Surveillance for recurrent bladder cancer using a point-of-care proteomic assay. JAMA. 2006 Jan 18. 295(3):299-305. [Medline]. Al-Sukhun S, Hussain M. Molecular biology of transitional cell carcinoma. Crit Rev Oncol Hematol. 2003 Aug. 47(2):181-93. [Medline]. Halling KC, Kipp BR. Bladder cancer detection using FISH (UroVysion assay). Adv Anat Pathol. 2008 Sep. 15(5):279-86. [Medline]. Soloway MS, Briggman V, Carpinito GA, Chodak GW, Church PA, Lamm DL, et al. Use of a new tumor marker, urinary NMP22, in the detection of occult or rapidly recurring transitional cell carcinoma of the urinary tract following surgical treatment. J Urol. 1996 Aug. 156(2 Pt 1):363-7. [Medline]. van Rhijn BW, van der Poel HG, van der Kwast TH. Urine markers for bladder cancer surveillance: a systematic review. Eur Urol. 2005 Jun. 47 (6):736-48. [Medline]. [Guideline] Babjuk M, Burger M, Zigeuner R, Shariat SF, van Rhijn BW, Compérat E, et al. EAU guidelines on non-muscle-invasive urothelial carcinoma of the bladder: update 2013. Eur Urol. 2013 Oct. 64 (4):639-53. [Medline]. [Full Text]. [Guideline] NCCN Clinical Practice Guidelines in Oncology. Bladder Cancer. National Comprehensive Cancer Network. Available at http://www.nccn.org/professionals/physician_gls/pdf/bladder.pdf. Version 5.2018 — July 3, 2018; Accessed: August 16, 2018. Hall MC, Chang SS, Dalbagni G, Pruthi RS, Seigne JD, Skinner EC, et al. Guideline for the management of nonmuscle invasive bladder cancer (stages Ta, T1, and Tis): 2007 update. J Urol. 2007 Dec. 178(6):2314-30. [Medline]. [Guideline] Stenzl A, Cowan NC, De Santis M, Jakse G, Kuczyk MA, Merseburger AS, et al. The updated EAU guidelines on muscle-invasive and metastatic bladder cancer. Eur Urol. 2009 Apr. 55(4):815-25. [Medline]. Chedgy EC, Black PC. Radical Cystectomy and the Multidisciplinary Management of Muscle-Invasive Bladder Cancer. JAMA Oncol. 2016 May 5. [Medline]. [Full Text]. Mitin T. Rethinking Radical Cystectomy as the Best Choice for Most Patients With Muscle-Invasive Bladder Cancer. JAMA Oncol. 2016 May 5. [Medline]. [Full Text]. Teo MT, Dyrskjøt L, Nsengimana J, Buchwald C, Snowden H, Morgan J, et al. Next-generation sequencing identifies germline MRE11A variants as markers of radiotherapy outcomes in muscle-invasive bladder cancer. Ann Oncol. 2014 Apr. 25 (4):877-83. [Medline]. [Full Text]. Serretta V, Galuffo A, Pavone C, Allegro R, Pavone-MacAluso M. Gemcitabine in intravesical treatment of Ta-T1 transitional cell carcinoma of bladder: Phase I-II study on marker lesions. Urology. 2005 Jan. 65(1):65-9. [Medline]. Sylvester RJ, van der Meijden AP, Witjes JA, Kurth K. Bacillus calmette-guerin versus chemotherapy for the intravesical treatment of patients with carcinoma in situ of the bladder: a meta-analysis of the published results of randomized clinical trials. J Urol. 2005 Jul. 174(1):86-91; discussion 91-2. [Medline]. Witjes JA, Hendricksen K. Intravesical pharmacotherapy for non-muscle-invasive bladder cancer: a critical analysis of currently available drugs, treatment schedules, and long-term results. Eur Urol. 2008 Jan. 53(1):45-52. [Medline]. Zaharoff DA, Hoffman BS, Hooper HB, Benjamin CJ Jr, Khurana KK, Hance KW, et al. Intravesical immunotherapy of superficial bladder cancer with chitosan/interleukin-12. Cancer Res. 2009 Aug 1. 69(15):6192-9. [Medline]. [Full Text]. Islam MA, Bhuiyan ZH, Shameem IA. Intravesical adjuvant therapy using mitomycin C. Mymensingh Med J. 2006 Jan. 15(1):40-4. [Medline]. Herr HW, Dalbagni G, Donat SM. Bacillus Calmette-Guérin without maintenance therapy for high-risk non-muscle-invasive bladder cancer. Eur Urol. 2011 Jul. 60(1):32-6. [Medline]. Schmidbauer J, Witjes F, Schmeller N, Donat R, Susani M, Marberger M. Improved detection of urothelial carcinoma in situ with hexaminolevulinate fluorescence cystoscopy. J Urol. 2004 Jan. 171(1):135-8. [Medline]. Jichlinski P, Guillou L, Karlsen SJ, Malmström PU, Jocham D, Brennhovd B, et al. Hexyl aminolevulinate fluorescence cystoscopy: new diagnostic tool for photodiagnosis of superficial bladder cancer--a multicenter study. J Urol. 2003 Jul. 170(1):226-9. [Medline]. Hungerhuber E, Stepp H, Kriegmair M, Stief C, Hofstetter A, Hartmann A, et al. Seven years' experience with 5-aminolevulinic acid in detection of transitional cell carcinoma of the bladder. Urology. 2007 Feb. 69(2):260-4. [Medline]. Kausch I, Sommerauer M, Montorsi F, Stenzl A, Jacqmin D, Jichlinski P, et al. Photodynamic diagnosis in non-muscle-invasive bladder cancer: a systematic review and cumulative analysis of prospective studies. Eur Urol. 2010 Apr. 57(4):595-606. [Medline]. Waknine Y. FDA Approves Cysview for Cystoscopic Detection of Papillary Bladder Cancer. Medscape Medical News, June 4, 2010. Available at http://www.medscape.com/viewarticle/722923. Accessed: January 10, 2013. Booth CM, Tannock IF. Benefits of Adjuvant Chemotherapy for Bladder Cancer. JAMA Oncol. 2015 Sep. 1 (6):727-8. [Medline]. Standard or Extended Pelvic Lymphadenectomy in Treating Patients Undergoing Surgery for Invasive Bladder Cancer. ClinicalTrials.gov. ClinicalTrials.gov. Available at http://clinicaltrials.gov/ct2/show/NCT01224665. Accessed: August 17, 2018. Mukesh M, Cook N, Hollingdale AE, Ainsworth NL, Russell SG. Small cell carcinoma of the urinary bladder: a 15-year retrospective review of treatment and survival in the Anglian Cancer Network. BJU Int. 2009 Mar. 103(6):747-52. [Medline]. Ehdaie B, Maschino A, Shariat SF, Rioja J, Hamilton RJ, Lowrance WT, et al. Comparative outcomes of pure squamous cell carcinoma and urothelial carcinoma with squamous differentiation in patients treated with radical cystectomy. J Urol. 2012 Jan. 187(1):74-9. [Medline]. Brinkman MT, Karagas MR, Zens MS, Schned A, Reulen RC, Zeegers MP. Minerals and vitamins and the risk of bladder cancer: results from the New Hampshire Study. Cancer Causes Control. 2010 Apr. 21(4):609-19. [Medline]. [Full Text]. O'Donnell MA, Lilli K, Leopold C. Interim results from a national multicenter phase II trial of combination bacillus Calmette-Guerin plus interferon alfa-2b for superficial bladder cancer. J Urol. 2004 Sep. 172(3):888-93. [Medline]. Nepple KG, Lightfoot AJ, Rosevear HM, O'Donnell MA, Lamm DL. Bacillus Calmette-Guérin with or without interferon a-2b and megadose versus recommended daily allowance vitamins during induction and maintenance intravesical treatment of nonmuscle invasive bladder cancer. J Urol. 2010 Nov. 184(5):1915-9. [Medline]. Kamat AM, Dickstein RJ, Messetti F, Anderson R, Pretzsch SM, Gonzalez GN, et al. Use of fluorescence in situ hybridization to predict response to bacillus Calmette-Guérin therapy for bladder cancer: results of a prospective trial. J Urol. 2012 Mar. 187(3):862-7. [Medline]. [Full Text]. Barlow L, McKiernan JM, Benson MC. Long-term survival outcomes with intravesical docetaxel for recurrent nonmuscle invasive bladder cancer after previous bacillus Calmette-Guérin therapy. J Urol. 2013 Mar. 189(3):834-9. [Medline]. Fradet Y, Grossman HB, Gomella L, Lerner S, Cookson M, Albala D, et al. A comparison of hexaminolevulinate fluorescence cystoscopy and white light cystoscopy for the detection of carcinoma in situ in patients with bladder cancer: a phase III, multicenter study. J Urol. 2007 Jul. 178(1):68-73; discussion 73. [Medline]. Jocham D, Witjes F, Wagner S, Zeylemaker B, van Moorselaar J, Grimm MO, et al. Improved detection and treatment of bladder cancer using hexaminolevulinate imaging: a prospective, phase III multicenter study. J Urol. 2005 Sep. 174(3):862-6; discussion 866. [Medline]. Stenzl A, Burger M, Fradet Y, Mynderse LA, Soloway MS, Witjes JA, et al. Hexaminolevulinate guided fluorescence cystoscopy reduces recurrence in patients with nonmuscle invasive bladder cancer. J Urol. 2010 Nov. 184(5):1907-13. [Medline]. Hermann GG, Mogensen K, Carlsson S, Marcussen N, Duun S. Fluorescence-guided transurethral resection of bladder tumours reduces bladder tumour recurrence due to less residual tumour tissue in Ta/T1 patients: a randomized two-centre study. BJU Int. 2011 Oct. 108(8 Pt 2):E297-303. [Medline]. Tilki D, Reich O, Svatek RS, Karakiewicz PI, Kassouf W, Novara G, et al. Characteristics and outcomes of patients with clinical carcinoma in situ only treated with radical cystectomy: an international study of 243 patients. J Urol. 2010 May. 183(5):1757-63. [Medline]. Davis JW, Castle EP, Pruthi RS, Ornstein DK, Guru KA. Robot-assisted radical cystectomy: an expert panel review of the current status and future direction. Urol Oncol. 2010 Sep-Oct. 28(5):480-6. [Medline]. Chang SS, Cookson MS. Radical cystectomy for bladder cancer: the case for early intervention. Urol Clin North Am. 2005 May. 32(2):147-55. [Medline]. Sánchez-Ortiz RF, Huang WC, Mick R, Van Arsdalen KN, Wein AJ, Malkowicz SB. An interval longer than 12 weeks between the diagnosis of muscle invasion and cystectomy is associated with worse outcome in bladder carcinoma. J Urol. 2003 Jan. 169(1):110-5; discussion 115. [Medline]. Standard or Extended Pelvic Lymphadenectomy in Treating Patients Undergoing Surgery for Invasive Bladder Cancer. ClinicalTrials.gov. Available at http://clinicaltrials.gov/ct2/show/NCT01224665. Accessed: November 13, 2012. Raghavan D, Burgess E, Gaston KE, Haake MR, Riggs SB. Neoadjuvant and adjuvant chemotherapy approaches for invasive bladder cancer. Semin Oncol. 2012 Oct. 39(5):588-97. [Medline]. Winquist E, Kirchner TS, Segal R, Chin J, Lukka H. Neoadjuvant chemotherapy for transitional cell carcinoma of the bladder: a systematic review and meta-analysis. J Urol. 2004 Feb. 171(2 Pt 1):561-9. [Medline]. Grossman HB, Natale RB, Tangen CM, Speights VO, Vogelzang NJ, Trump DL, et al. Neoadjuvant chemotherapy plus cystectomy compared with cystectomy alone for locally advanced bladder cancer. N Engl J Med. 2003 Aug 28. 349(9):859-66. [Medline]. Herr HW, Faulkner JR, Grossman HB, Natale RB, deVere White R, Sarosdy MF, et al. Surgical factors influence bladder cancer outcomes: a cooperative group report. J Clin Oncol. 2004 Jul 15. 22(14):2781-9. [Medline]. Griffiths G, Hall R, Sylvester R, Raghavan D, Parmar MK. International phase III trial assessing neoadjuvant cisplatin, methotrexate, and vinblastine chemotherapy for muscle-invasive bladder cancer: long-term results of the BA06 30894 trial. J Clin Oncol. 2011 Jun 1. 29(16):2171-7. [Medline]. [Full Text]. Mooso BA, Vinall RL, Mudryj M, Yap SA, deVere White RW, Ghosh PM. The role of EGFR family inhibitors in muscle invasive bladder cancer: a review of clinical data and molecular evidence. J Urol. 2015 Jan. 193 (1):19-29. [Medline]. Sternberg CN, Skoneczna I, Kerst JM, Albers P, Fossa SD, et al. Immediate versus deferred chemotherapy after radical cystectomy in patients with pT3-pT4 or N+ M0 urothelial carcinoma of the bladder (EORTC 30994): an intergroup, open-label, randomised phase 3 trial. Lancet Oncol. 2015 Jan. 16 (1):76-86. [Medline]. Saxman SB, Propert KJ, Einhorn LH, Crawford ED, Tannock I, Raghavan D, et al. Long-term follow-up of a phase III intergroup study of cisplatin alone or in combination with methotrexate, vinblastine, and doxorubicin in patients with metastatic urothelial carcinoma: a cooperative group study. J Clin Oncol. 1997 Jul. 15(7):2564-9. [Medline]. Sternberg CN, de Mulder P, Schornagel JH, Theodore C, Fossa SD, van Oosterom AT, et al. Seven year update of an EORTC phase III trial of high-dose intensity M-VAC chemotherapy and G-CSF versus classic M-VAC in advanced urothelial tract tumours. Eur J Cancer. 2006 Jan. 42(1):50-4. [Medline]. von der Maase H, Sengelov L, Roberts JT, Ricci S, Dogliotti L, Oliver T, et al. Long-term survival results of a randomized trial comparing gemcitabine plus cisplatin, with methotrexate, vinblastine, doxorubicin, plus cisplatin in patients with bladder cancer. J Clin Oncol. 2005 Jul 20. 23(21):4602-8. [Medline]. Iwasaki K, Obara W, Kato Y, Takata R, Tanji S, Fujioka T. Neoadjuvant gemcitabine plus carboplatin for locally advanced bladder cancer. Jpn J Clin Oncol. 2013 Feb. 43(2):193-9. [Medline]. Bellmunt J, Théodore C, Demkov T, Komyakov B, Sengelov L, Daugaard G, et al. Phase III trial of vinflunine plus best supportive care compared with best supportive care alone after a platinum-containing regimen in patients with advanced transitional cell carcinoma of the urothelial tract. J Clin Oncol. 2009 Sep 20. 27(27):4454-61. [Medline]. Rosenberg JE, Hoffman-Censits J, Powles T, van der Heijden MS, Balar AV, Necchi A, et al. Atezolizumab in patients with locally advanced and metastatic urothelial carcinoma who have progressed following treatment with platinum-based chemotherapy: a single-arm, multicentre, phase 2 trial. Lancet. 2016 Mar 4. [Medline]. Balar AV, Galsky MD, Rosenberg JE, Powles T, Petrylak DP, Bellmunt J, et al. Atezolizumab as first-line treatment in cisplatin-ineligible patients with locally advanced and metastatic urothelial carcinoma: a single-arm, multicentre, phase 2 trial. Lancet. 2017 Jan 7. 389 (10064):67-76. [Medline]. Powles T, Durán I, van der Heijden MS, et al. Atezolizumab versus chemotherapy in patients with platinum-treated locally advanced or metastatic urothelial carcinoma (IMvigor211): a multicentre, open-label, phase 3 randomised controlled trial. Lancet. 2018 Feb 24. 391 (10122):748-757. [Medline]. Sharma P, Retz M, Siefker-Radtke A, Baron A, Necchi A, Bedke J, et al. Nivolumab in metastatic urothelial carcinoma after platinum therapy (CheckMate 275): a multicentre, single-arm, phase 2 trial. Lancet Oncol. 2017 Jan 25. [Medline]. Powles T, O'Donnell PH, Massard C, Arkenau HT, Friedlander TW, Hoimes CJ, et al. Efficacy and Safety of Durvalumab in Locally Advanced or Metastatic Urothelial Carcinoma: Updated Results From a Phase 1/2 Open-label Study. JAMA Oncol. 2017 Sep 14. 3 (9):e172411. [Medline]. Apolo AB, Infante JR, Balmanoukian A, Patel MR, Wang D, Kelly K, et al. Avelumab, an Anti-Programmed Death-Ligand 1 Antibody, In Patients With Refractory Metastatic Urothelial Carcinoma: Results From a Multicenter, Phase Ib Study. J Clin Oncol. 2017 Apr 4. JCO2016716795. [Medline]. Balar AV, Castellano D, O'Donnell PH, Grivas P, Vuky J, Powles T, et al. First-line pembrolizumab in cisplatin-ineligible patients with locally advanced and unresectable or metastatic urothelial cancer (KEYNOTE-052): a multicentre, single-arm, phase 2 study. Lancet Oncol. 2017 Nov. 18 (11):1483-1492. [Medline]. Bellmunt J, de Wit R, Vaughn DJ, Fradet Y, Lee JL, Fong L, et al. Pembrolizumab as Second-Line Therapy for Advanced Urothelial Carcinoma. N Engl J Med. 2017 Mar 16. 376 (11):1015-1026. [Medline]. Siefker-Radtke AO, Necchi A, Park SH, Garcia-Donas J, Huddart RA, Frederick E, et al. First results from the primary analysis population of the phase 2 study of erdafitinib (ERDA; JNJ-42756493) in patients (pts) with metastatic or unresectable urothelial carcinoma (mUC) and FGFR alterations (FGFRalt) (Abstract 4503). Presented at the American Society of Clinical Oncology 2018 Annual Meeting. 2018 Jun 03. Chicago, IL. [Full Text]. [Guideline] Chang SS, Boorjian SA, Chou R, Clark PE, Daneshmand S, Konety BR, et al. Diagnosis and Treatment of Non-Muscle Invasive Bladder Cancer: AUA/SUO Guideline. J Urol. 2016 Jun 16. [Medline]. [Full Text]. [Guideline] Alfred Witjes J, Lebret T, Compérat EM, Cowan NC, De Santis M, Bruins HM, et al. Updated 2016 EAU Guidelines on Muscle-invasive and Metastatic Bladder Cancer. Eur Urol. 2016 Jun 30. [Medline]. [Full Text]. [Guideline] Babjuk M, Böhle A, Burger M, Capoun O, Cohen D, Compérat EM, et al. EAU Guidelines on Non-Muscle-invasive Urothelial Carcinoma of the Bladder: Update 2016. Eur Urol. 2016 Jun 17. [Medline]. [Full Text]. [Guideline] Bellmunt J, Orsola A, Leow JJ, Wiegel T, De Santis M, Horwich A, et al. Bladder cancer: ESMO Practice Guidelines for diagnosis, treatment and follow-up. Ann Oncol. 2014 Sep. 25 Suppl 3:iii40-8. [Medline]. [Full Text]. Moyer VA, U.S. Preventive Services Task Force. Screening for bladder cancer: U.S. Preventive Services Task Force recommendation statement. Ann Intern Med. 2011 Aug 16. 155 (4):246-51. [Medline]. Recommendations for Clinical Preventive Services: Bladder Cancer, Adults. Leawood, KS: American Academy of Family Physicians; 2011. American Academy of Family Physicians. Available at http://www.aafp.org/patient-care/clinical-recommendations/all/bladder-cancer.html. Accessed: May 11, 2017. Bladder Cancer. American Cancer Society. Available at https://www.cancer.org/cancer/bladder-cancer.html. May 23, 2016; Accessed: August 16, 2018. [Guideline] Rouprêt M, Babjuk M, Böhle A, et al. European Association of Urology guidelines on upper tract urothelial carcinomas: 2016 update. European Association of Urology. Available at http://uroweb.org/guideline/upper-urinary-tract-urothelial-cell-carcinoma/. Accessed: August 29, 2016. Ploeg M, Kums AC, Aben KK, van Lin EN, Smits G, Vergunst H, et al. Prognostic factors for survival in patients with recurrence of muscle invasive bladder cancer after treatment with curative intent. Clin Genitourin Cancer. 2011 Sep. 9(1):14-21. [Medline]. Bruins HM, Djaladat H, Ahmadi H, Sherrod A, Cai J, Miranda G, et al. Incidental cancer of the prostate in patients with bladder urothelial carcinoma: comprehensive analysis of 1476 radical cystoprostatectomy specimens. J Urol. 2013 May 23. [Medline]. Zehnder P, Studer UE, Daneshmand S, et al. Outcomes of radical cystectomy with extended lymphadenectomy alone in patients with lymph node-positive bladder cancer who are unfit for or who decline adjuvant chemotherapy. BJU Int. 2014 Apr. 113(4):554-60. [Medline]. In an ileal conduit, a small segment of ileum is taken out of continuity with the gastrointestinal tract but is maintained on its mesentery. Ureters are anastomosed to one end of this ileal segment, and the other end is brought out as a stoma to the abdominal wall. In an Indiana pouch, a urinary reservoir is created from detubularized right colon and an efferent limb of terminal ileum. Terminal ileum is plicated and brought to the abdominal wall. The continence mechanism is the ileocecal valve. In an orthotopic neobladder, a segment of ileum is used to construct a neobladder, which is connected to the urethra. Orthotopic neobladder most closely restores the natural storage and voiding function of the native bladder. High power, Pap stain showing high grade urothelial carcinoma on a bladder wash cytology. Intermediate power, H and E stain of urothelial carcinoma in situ. The superficial cells shed into the urine and correlate with those seen in cytologic bladder washing or urine cytology. High power, H and E stain of high grade urothelial carcinoma. This tumor is now invasive into the muscularis propria (smooth muscle seen in center of image). (A) When infused into the bladder, the optical imaging agent hexaminolevulinate (Cysview) accumulates preferentially in malignant cells. (B) On blue-light cystoscopy, the collection of hexaminolevulinate within tumors is visible as bright red spots. Courtesy of Gary David Steinberg, MD, FACS. *FISH - Fluorescent in situ hybridization.